The trial of Oscar Pistorius for the Murder of his girlfriend, Reeva Steenkamp continues. 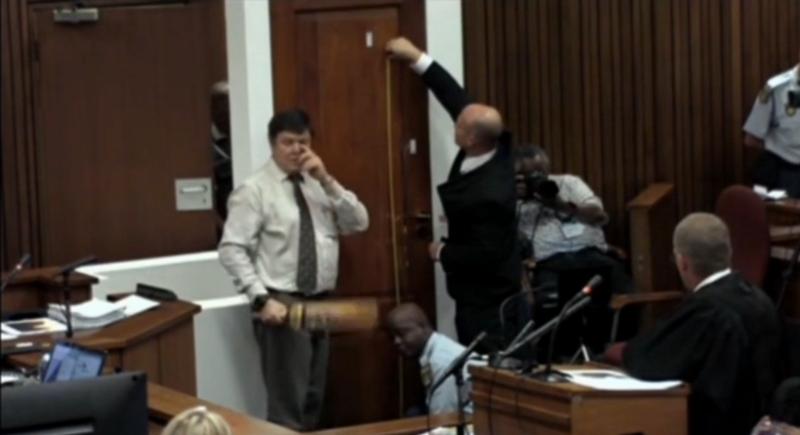 Yesterday Lt. Col. Vermeulen testified with regards to the cricket bat with which Pistorius used to break down the bathroom door. 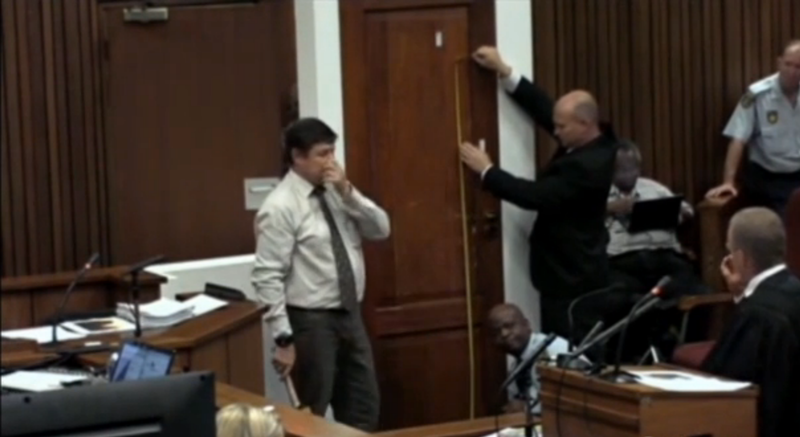 The prosecution is asserting that Pistorius did not have prostheses on - while the defense says the opposite is true. The following body language analysis does not state one or the other - however it is highly conclusive for considerable anxiety on the part of Lt. Col. Vermeulen during his testimony. Moreover other nonverbal signals of Vermeulen's are highly consistent with lying. At 1:03 we see a "False Tie Adjust". As the prosecuting attorney is describing the position of the cricket bat on the door. The false tie adjust is highly consistent with significant anxiety. As he says, "... Approximately 1.85 meters ..."
As the prosecuting attorney says, "Colonel just go back - and I want you to ...."
Just as Vermeulen says, "My Lady, if I stand upright, ah, and I'm, 1.79 meters tall ..."
Most men lie about their height - in the social setting this is one thing - in court it is another. Just after Vermeulen said, "... it would have been a very uncomfortable, unnatural position [inaudible]." 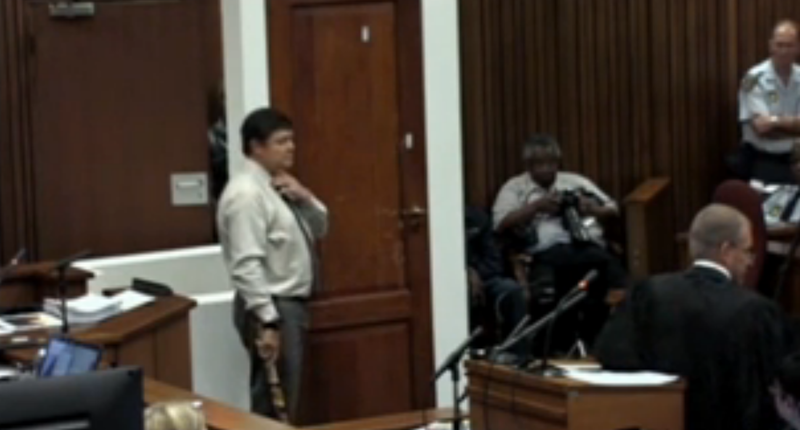 Officer Vermeulen should not have this level of anxiety during testimony. He is not on trial - Pistorius is. Nose rubs (or touches, scratches) when oneself or another person are making declarative statements are highly correlative with deception or belief of deception. The person feels they are hearing deception - regardless of who is speaking. as a witness - e.g. liars lie. indicating that other nose rubs are also indeed lies. 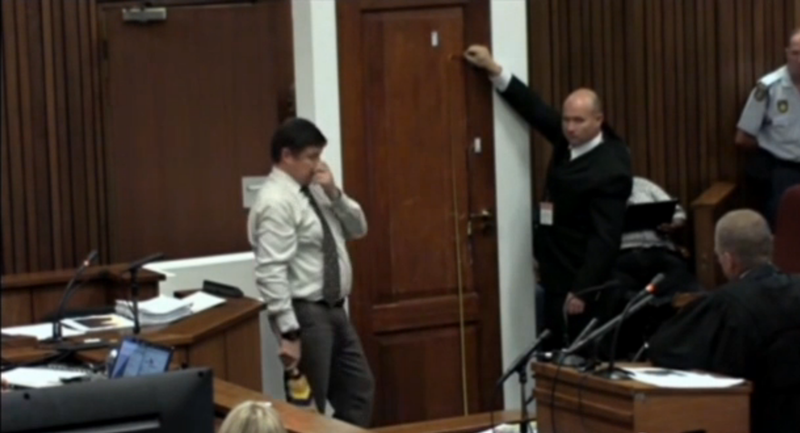 This body language alone does not indicate whether Oscar Pristorius is guilty or innocent of premeditation - it does however show that Lt. Col. Vermeulen is not being objective and is very probably being deceptive.